Naima Mameri has always enjoyed weaving. She began as a self-taught weaver at 10 years old, when she fashioned herself a loom and tried to replicate the work of her neighbor. Noticing her talent and enthusiasm for the art, this neighbor sat with Naima and showed her the basic techniques of weaving. 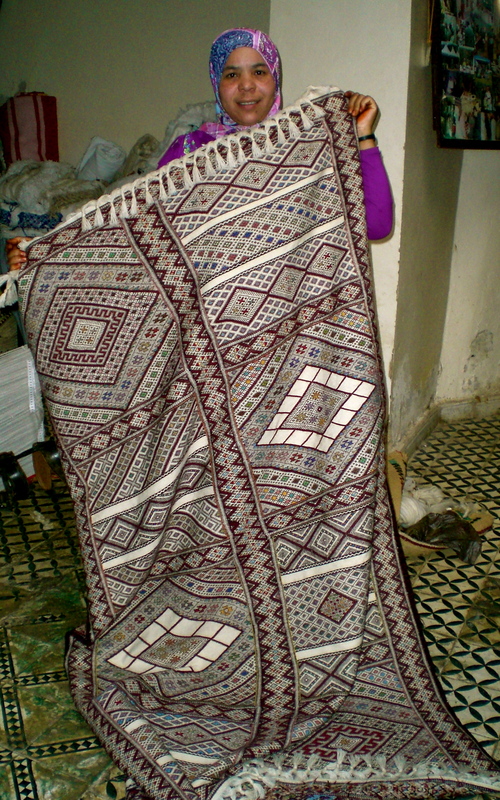 Young Naima would dream of a pattern for a piece and wake up in the middle of the night to begin weaving. Naima never finished elementary school, instead pursuing her weaving to earn money for her family. She moved from Souq al Had, a neighboring town, to Ain Leuh in 2000 when she was married, and officially joined the cooperative in 2002. Her husband, Ghazi, performs in a traditional Middle Atlas music group as a drummer. 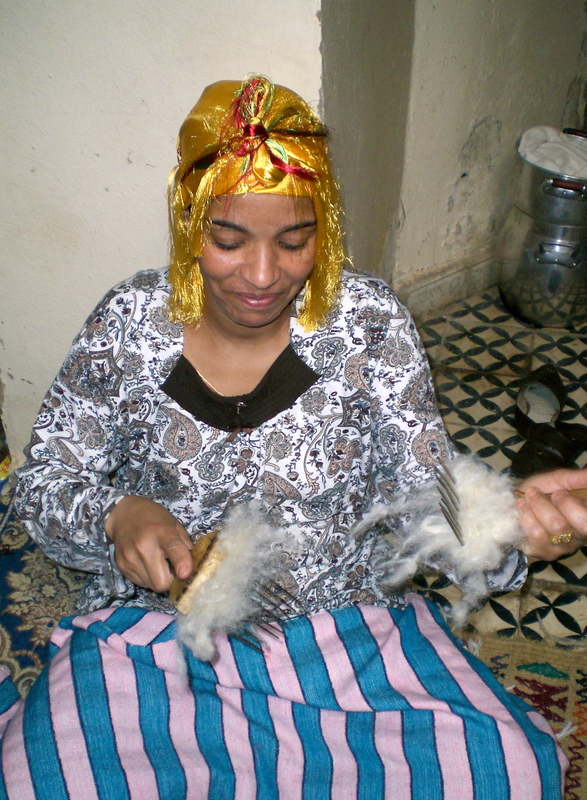 Amazigh music is an integral part of the Mameri family, and Naima also knows how to sing and play traditional music. Naima is the woman in black playing the drum in this video. Naima and Ghazi have two children, Shaima 13, and Fatima Zahra, 10. Fatima Zahra would like to learn how to weave and follow in her mother’s footsteps, but Naima has encouraged Fatma Zahra to continue studying instead. Naima believes that there is not enough economic opportunity in weaving to allow her daughter to become an apprentice. However, Naima still enjoys weaving because it gives her something to do when she is not taking care of her family and home, and is glad to be able to help pay for household expenses. Hashamia Dwerie, born and raised in Ain Leuh, began learning how to weave at the cooperative in 1979 when she was 12 years old, dropping out of elementary school to begin earning an income. She likes to incorporate as many traditional motifs in her weavings as possible, and encourages other women to do so as well. She says that the traditional motifs are not only beautiful, but a way to perpetuate the culture of her ancestors. She patiently sat with me, explaining the meaning and repeating the names of each motif in her work for one of my previous blog posts. Her husband passed away in 2005, so Hashamia now has to support herself and two of her three children by herself. 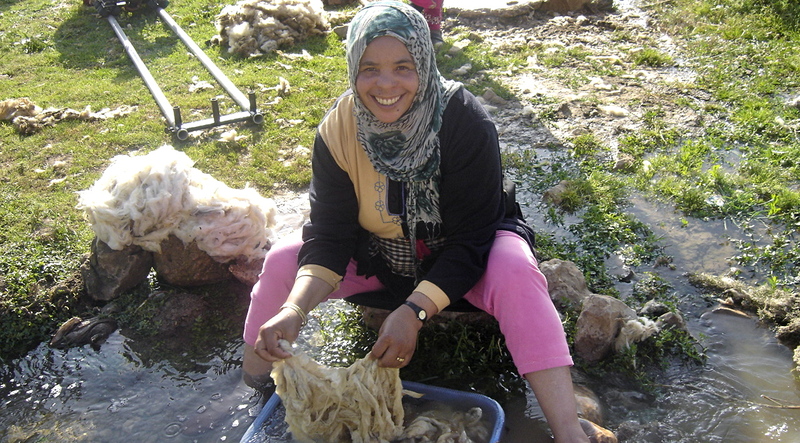 In addition to being one of the master weavers at the cooperative, Hashamia supplements her income other forms of work. She buys sheared wool at the weekly souq for about 25 cents a pound, washes, cleans and spins it to sell at the cooperative for $1.50 a pound. She also works in the fields that surround Ain Leuh. Most recently, she earned 80 dirhams a day, about $9.50 picking cherries, and will work in the apple orchards in the fall. Khadija Rachidi, 23 years old, is the youngest member of the cooperative. She began as an apprentice in 2006 at the cooperative after finishing elementary school, and has now been working as a full-fledged member of the cooperative since 2008. Khadija first tried working as a tailor, but was later drawn to the more traditional work of weaving. Khadija is a very talented young weaver, and hopes to enter the annual national traditional arts competition in the fall. She is single and lives with her older sister Jamila, also a weaver at the cooperative, two older brothers and their parents. Meet Khadija Rachidi in this short clip. Amazing videos! Looked like quite a khitana party!